Amphetamine , (chemical formula -C9H13N) a prescription CNS stimulant commonly used to treat attention-deficit hyperactivity disorder (ADHD) in adults and children. It is also used to treat symptoms of traumatic brain injury and the daytime drowsiness symptoms of narcolepsy and chronic fatigue syndrome. Initially it was more popularly used to diminish the appetite and to control weight. Brand names of the drugs that contain amphetamine include Adderall and Dexedrine. The drug is also used illegally as a recreational club drug and as a performance enhancer. The name amphetamine is derived from its chemical name: alpha-methylphenethylamine. The name is also used to refer to the class of compounds derived from amphetamine, often referred to as the substituted amphetamines. Amphetamine was first synthesized in 1887 by Lazar Edeleanu at the University of Berlin. He named the compound phenylisopropylamine. It was one of a series of compounds related to the plant derivative ephedrine, which had been isolated from Ma-Huang that same year by Nagayoshi Nagai. No pharmacological use was found for amphetamine until 1927, when pioneer psychopharmacologist Gordon Alles resynthesized it. Alles was part of a group of researchers looking for an ephedrine substitute. In 1937, it became available in tablet form. During World War II it was extensively used to combat fatigue and increase alertness in soldiers. After decades of reported abuse, the FDA banned Benzedrine inhalers, and limited amphetamines to prescription use in 1965, but illegal use became common. Amphetamine became a schedule II drug with the passage of the Controlled Substances Act in 1970. 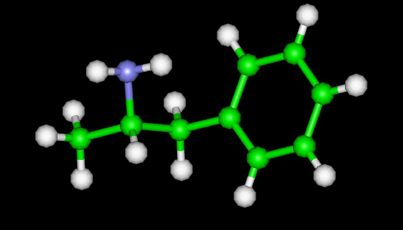 Amphetamines release stores of norepinephrine and dopamine from nerve endings by converting the respective molecular transporters into open channels. Amphetamine also releases stores of serotonin from synaptic vesicles when taken in relatively high doses. This effect is more pronounced in methamphetamine use. Like methylphenidate (Ritalin), amphetamines also prevent the monoamine transporters for dopamine and norepinephrine from recycling them (called reuptake inhibition), which leads to increased amounts of dopamine and norepinephrine in synaptic clefts. These combined effects rapidly increase the concentrations of the respective neurotransmitters in the synaptic cleft, which promotes nerve impulse transmission in neurons that have those receptors. Amphetamine is a chiral compound. The racemic mixture can be divided into its optical antipodes: levo- and dextro-amphetamine. Amphetamine is the parent compound of its own structural class, comprising a broad range of psychoactive derivatives, e.g., MDMA (Ecstasy) and the N-methylated form, methamphetamine. Amphetamine is a homologue of phenethylamine. At first, the medical drug came as the salt racemic-amphetamine sulfate (racemic-amphetamine contains both isomers in equal amounts). Today, dextroamphetamine sulfate is the predominant form of the drug used; it consists entirely of the d-isomer. Attention disorders are often treated using Adderall or a generic equivalent, a formulation of mixed amphetamine salts that contain both racemic-amphetamine and d-amphetamine in the sulfate and saccharate forms mixed to a final ratio of 3 parts d-amphetamine to 1 part l-amphetamine.